Shopping yard sales is a great way to save money and find amazing items. The majority of yard sale prices beat eBay and thrift store prices with ease. However, it seems the ratio of good garage sales is about 5:1. This means it might take you five lackluster garage sales before you hit the ultimate one. 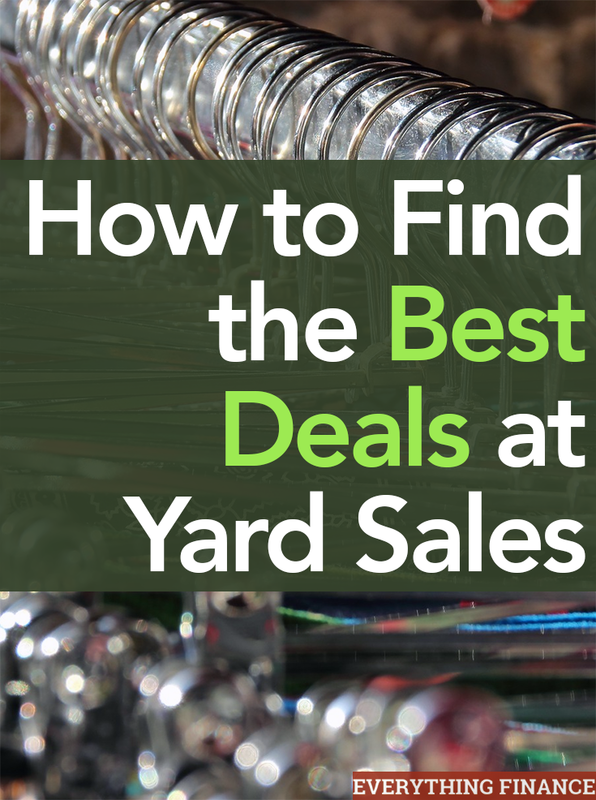 Here are a few tips to find the best deals at a yard sale. I’ve had some success simply driving around my neighborhood without a plan, but I do live in a popular neighborhood close to many schools and a mall. Even so, I think planning out your route the day before is essential. This way, you can hit the garage sales that have what you’re looking for. For example, if I’m only looking for kids clothes or baby items, my plan wouldn’t include garage sales full of antiques or tools. You can usually check the inventory of a yard sale just by looking at Craigslist. Another important tip is to have addresses of the Craigslist sales you really want to go to. Sometimes yard sale signage is hard to follow, and a GPS makes it easier to navigate. The saying, “The early bird gets the worm” is true for garage sales. If you roll out of bed at 9 in the morning, don’t expect to find stellar deals. Most garage sales have been picked over by this hour. Try starting at 6AM, as this will give you time to go to the ATM, get coffee, and hit the earliest sales right on the hour. If you hit a garage sale where you can buy a lot of items you want in bulk, then you’ll most likely get a better deal. For example, if I see a big pile of clothes that I want, or a stack of books, I’ll ask how much per item. If it’s a good price, I then ask, “If I buy a lot, will you give me a great deal?” Usually, the answer is yes. If you see that a person’s yard sale prices are cheap, then this is your opportunity to buy as much as you want and then haggle a good overall cost. If the seller is strict on the prices and isn’t willing to negotiate, it’s probably worth your time to go to another sale. The point is to find the biggest yard sale you can. Also, when it’s a charity sale held in a school or church parking lot, prices are generally much cheaper, since people are selling donated items. Even with these tips, you’re still likely to hit some duds. I just hate when I see a sale advertised as a “Large Sale” when the sellers only have about 100 small items out. It’s best to keep a list of things you are looking for and to keep hitting the sales every weekend. Shop from 6-9 a.m. to maximize your time and efforts. What has been your best garage sale find? Do you enjoy shopping yard sales or garage sales? Why or why not?